Live the Best of your potential. A step-by-step guide for personal growth and development. Description of "Live the Best of your potential." “Live the Best of Your Potential” is a book for those personal growth enthusiasts who want to live above average and powerful life. It is an essential step-by-step guide for individuals who want to understand fundamentals of personal growth and development. Each topic is explained through inspirational quotes, personal experience of author, followed by progress check of reader’s understanding of topic and finally advice on further steps to be taken. If read regularly, this book can prove highly beneficial in developing new mindsets and perspective for living a powerful life. This has a collection of some of the core areas of personal growth and development. Controlling anger, ego, how to develop discipline in life, idea of personal success etc. are some of the core topics explored here. These topics are also available for free to read on author's blog http://abundancethinkers.in/blog/. But on blog, there is no sequence maintained and topics are not supported with any additional advice or further directions by author on each topic. There is also a free gift, a colorful, print-ready poster on personal growth, with every purchase of book. Age is no bar for reading this book, in fact if somebody starts reading it at early age it can help wonderfully to create awareness about personal growth and development. If you are looking to gift somebody with something memorable and life transforming then you may end your search by gifting this book. Seema Bhatnagar is a blogger, writer and professional life coach. She coaches people about personal growth and development. Her effective life coaching enables people to live the best of personal potential. Personal growth and development is her passion, before taking up this as her new career she was an established and seasoned senior IT professional with international experience. It was her strong passion to live a more powerful and purposeful life that encouraged her to pursue personal growth and development as her new career. This book reflects her in-depth experience of life and her passion to inspire others for personal growth. 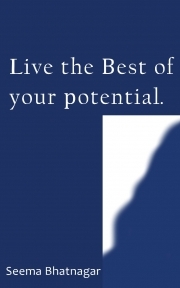 Reviews of "Live the Best of your potential."